Don't Fear The Reaper: Warm-blooded killers? Like a series of aftershocks, the percussive loops on Drums and Guns follow the earthquake that was The Great Destroyer. Low, long known for their glacial tempos and imposing sparseness, underwent a dramatic change in 2005, moving in a more conventional rock direction. They included more riffage, and they played harder, louder and faster. Where there had once been negative space, on The Great Destroyer there was a tough skin of discord. That dynamic shake-up continues to play itself out. This time Low drop the bristly electric guitars in exchange for repeating rhythms. They've retained the brisker tempos, however, and that alone gives the album a different character than much of the band's previous work. 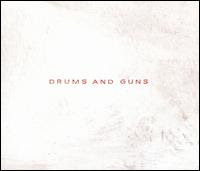 Tellingly, Drums and Guns contains just two tracks that reach beyond the four-minute mark, and then only slightly. Most are about three minutes, and a few are considerably shorter than that. Compared to 1997's Songs for a Dead Pilot EP, which featured a 13-minute-plus song sandwiched between ones well-exceeding four minutes, this feels like a revelation, like the research proclaiming that the cold-blooded dinosaurs we all thought we knew as children were actually warm-blooded creatures, springing onto their prey with alarming speed. Or something like that. But while the songs are quicker, the subject matter isn't likely to make people jump up and dance. Over a hornetlike buzz of guitars, opening track "Pretty People" levels a hard truth at the listener: You're gonna die. Just like the poets and the soldiers, you're gonna die. Those little babies? Yeah, they're gonna die. We're all gonna die. The only question is when. The kick drum shudders with the gravity of a public execution. Mortality is everywhere on Drums and Guns. "Sandinista" asks, "Where would you go if the gun fell in your hands? / Home to the kids or to sympathetic friends?" It posits that a person can be fated to kill, much as death is predestined. "Breaker" is a few steps ahead, already at the funeral, organ pealing heavenward. At this particular funeral, the clergymen might also be the Neptunes, as handclaps and a programmed beat make a good case for finger-drumming on the pews. Overtly rhythmic looping carries over to the box-top rapping and tapping of "Always Fade," though the message changes from activism to defeatism. A similar depressive ribbon entwines "Dust on the Window," probably the closest relative to Low's ice-age material. Gradually fading in with Mimi Parker's skeletal snare, it finds her drifting "one day closer / One sunset further behind." Through a veil of cryptic lines --- "breaking my arm that won't heal" is another --- Parker conveys a muted despair in her only solo appearance singing lead. Drums and Guns, then, follows The Great Destroyer in its masculine spirit, with Alan Sparhawk being the dominant vocal force. But Parker does harmonize with him on most songs, so the shift is subtle. A highlight of their vocal interplay is "Your Poison," which arranges their harmonies in the style of a gospel choir and overlays them with Sparhawk and Parker in the foreground. This technique shows Low experimenting with filling the space they once reserved for haunting echoes. On "Take Your Time," they layer ghostly harmonies with a chime, a metronomic beat, a piano, Matt Livingston's bass and other elements. There are a few corners of the album that escape the penetrating gloom, as on the playful "Hatchet," which bounds along with its bass run, sweetly suggesting, "Let's bury the hatchet like / the Beatles and the Stones." Mostly, though, it cycles like the looping percussion, lending a circular feeling to Drums and Guns. The final song, "Violent Past," could be a response to "Pretty People," answering its death knell with, "All I can do is fight / Even if I know you're right." Still, Sparhawk sounds a lot less resigned on the cut before it, "Murderer," calling out the Man Upstairs ("Don't act so innocent / I've seen you pound your fist into the earth") and making him a proposition --- to do his "dirty work."